Recently I have noticed some killer Facebook applications designed to give your Fan Page more flair. 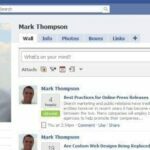 I thought I would feature some of the companies that built these applications, along with links to these custom applications that you can try out on your own Facebook Fan Page. You can also check out the StayOnSearch Fan Page here that has some of the applications I mention in this post. Tigerlily is a Facebook Application Development company based in Paris, France. They develop turn-key solutions to better manage your Facebook Fan Page. Their applications provide features like wall post scheduling, moderation for wall comments, and campaign management. In addition to application development, they also provide Facebook consulting, to help your company create a successful Facebook strategy. Check out their Facebook application that you can add to your Fan Page. 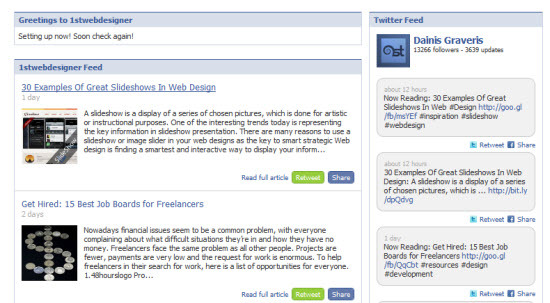 It allows you to pull in your RSS blog feed and Twitter feed into a clean and professional looking tab. It allows you to easily retweet and share your blog posts on Facebook. It also allows you to see your latest tweets that can be shared on Twitter and Facebook. Currently they have a free version of their application that has limited features and capabilities, however you can purchase the pro version that gives you full customization including statistics, design editing capabilities, exclusive widgets and more. Involver is a technology platform that companies use to integrate into their social media profiles. Their current clients include Audi, Nike, Ford, GM, Microsoft, and Snapple. Involver offers a large range of free Facebook applications for various business objectives. They have apps for RSS feeds, Twitter, Flickr, Photo Galleries, Slideshows, PDFs, File Sharing, and YouTube. There are professional applications that are available that can provide additional functionality including signup integration, coupon incentives, poll capabilities, and custom welcome landing page. For an annual service and licensing fee which covers the application setup and engineering and custom branding, you can use their premium applications. These applications a music player, facebook chat connect, social quizzes, flash embeds, games, hybrids of applications, and more custom development. Currentlyl Involver is promoting their Music for Pages application that allows artists to embed their music into Facebook so fans can play their music and purchase the cd. See the Alicia Keys Fan Page that they have integrated the custom app. Context Optional is a leader in helping brands, agencies, and publishers engage their audience and customers through the use of social networks. They are headquarted in San Francisco, however they have offices in New York and Seattle. The company currently manages applications with 12 million monthly active users on Facebook alone. Content Opentional offers Facebook modules for help with moderation, applications, publishing, and analytics. Their moderation modules allow for real-time notifications for a users activity on Facebook. Using things like e-mail notifications, custom rules, bulk approvals and whitelists, and a consolidated web view will make moderation faster and easier. Their application modules that will help integrate things like virtual gifts, polls, product sampling, and photo/video contests. The publishing module allows for a user or group of users to schedule posts on Facebook. Their analytics module will help gather key data about your Facebook users, fan growth, and user activity. Watch the video to learn more about their Facebook Applications.